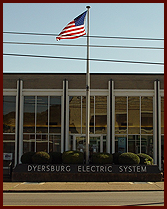 Dyersburg Electric System is municipally owned and governed by a five member board appointed by the Mayor of Dyersburg and confirmed by the Board of Aldermen. The Board sets all policies, has exclusive control of the electric distribution system, and appoints the President/CEO. Dyersburg Electric System is a public utility owned by the City of Dyersburg, Tennessee. The City of Dyersburg's electric operations began in 1902 when the city bought an existing light and water plant from Frank Shepard for $8,750.00. The distribution system was expanded gradually and was extended into the surrounding rural area during the period 1920-1940. By 1955, the demand for electricity had outgrown the City's generating capacity. The City closed its generating plant in August 1957, after entering a twenty-year contract with TVA to supply Dyersburg Electric System's power needs. Under the terms of the contract, TVA supplies Dyersburg Electric System with power at a wholesale rate, which in turn is sold to the public at the lowest possible cost consistent with sound business practices.